As if the spectacular everyday attractions of Las Vegas aren’t enticing enough, along comes December and the city’s famed holiday offerings, giving you even more reasons to visit the entertainment capital of the world. With stimulating imagery (would you expect anything less?) and fun for the whole family, the holiday season brings Las Vegas to life in an entirely different way. If you are an adventurous Tahiti Village visitor who is willing to leave your Strip comfort zone, Las Vegas has wondrous holiday attractions throughout the city that should be on your must-see list. Located in suburban Henderson, about 10 miles east of the Strip, Ethel M Chocolates Holiday Cactus Garden is one of Las Vegas’ favorite holiday attractions. The three-acre Botanical Cactus Garden, adjacent to the Ethel M Chocolate Factory, is a sight to behold during the holiday season and features more than one million lights. Open through January 1, 2018, the annual event is free to attend. Visit us on select nights for choir performances in the garden and photos with Santa! Each season, the enormously talented horticulturalists and designers who make up the Bellagio Conservatory team transform this 14,000-square-foot floral playground into a holiday showcase of the distinctive sights and colors. The holiday seasonal exhibit, titled “Majestic Holiday Magic,” features the return of Queen Bellisima, and will take guests on a journey into her enchanted icy kingdom. The south bed houses the queen’s favorite family of Polar bears, playing and welcoming guests as they walk enter the Conservatory. Towering at a height of 30’, the north bed features the queen’s castle, guarded by her majestic rotating soldiers. Lastly, the west bed holds the main attraction for this year. The holiday tree is a sight to behold, standing 42’ in height and 18’ in diameter, and is adorned with many beautiful ornaments. Next to the tree stands Queen Bellisima herself, wearing her holiday best. The queen is ready for the holiday season, and is excited to welcome guests into her enchanted kingdom through Jan. 6. Celebrate the holidays with a cherished Southern Nevada tradition – the Magical Forest at Opportunity Village! The Magical Forest, approximately five miles west of the Strip, is filled with sparkling lights, nightly entertainment, great food and endless holiday cheer. Every year through Dec. 31 the grounds are transformed into a winter wonderland, featuring hundreds of trees lit with millions of bright LED lights and fun activities. Don’t miss it! Lace up your skates and enjoy the invigorating December weather at the Cosmopolitan’s outdoor ice skating rink through January 10, 2018. You’ll find fire pits, plenty of places to sit, and a menu of warm cocktails, comfort foods and hot chocolate. Snow showers fall every 30 minutes to complement the wintry holiday atmosphere. which also has a great view of the Las Vegas Strip. Admission ranges from $10-$20 and includes all-day skating access and skate rentals. During the holidays The Park transforms into Holiday at The Park, featuring ice skating, strolling carolers and holiday shops. The Park is a new area on the Las Vegas Strip that’s been created in the space around the new T-Mobile Arena, Park MGM, and New York-New York. For the holidays, The Park is decked out in dazzling lights and festive ornaments and features an 80-foot Christmas tree. Holiday at The Park is open daily until Jan. 7. Admission is free. Every year Sam’s Town Hotel & Gambling Hall, approximately 12 miles east of the Strip on Boulder Highway, transforms its pioneer-themed Mystic Falls Park Light and Water Show into a Winter Wonderland experience. The holiday display gives visitors a peek inside Santa’s workshop, where the elves are busy making toys and loading the sleigh. A nine-minute holiday laser light show features classic holiday tunes and runs daily every hour from 5 p.m. to 10 p.m. Cowboy Santa will be in the Park’s gazebo on Thursdays and Fridays from 4 p.m. to 8:30 p.m. and on weekends from noon to 8:30 p.m. through Friday, December 23, 2017. 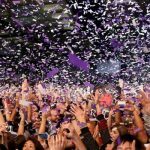 The Downtown Countdown fills Fremont Street with music and entertainment beginning in the early afternoon on New Year’s Eve and continuing into the wee hours. Each year more than 300,000 people gather on the Las Vegas Strip to celebrate the new year with a massive block party that culminates in a spectacular midnight fireworks display set off of the top of casinos up and down the Strip. Be sure to arrive early for the best vantage point. Streets close around 6 p.m., so be sure to plan ahead for transportation. 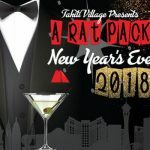 Spend a Rat Pack-style New Year’s Eve at Tahiti Village! Nobody does New Year’s Eve like Las Vegas and Tahiti Village!